Carmakers are scrambling to tease forthcoming reveals for the Frankfurt Auto Show. One automaker that’s been conspicuously quiet, however, is Lamborghini. Since the reveal of the all-new Aventador S coupe last year, it was surely only a matter of time before the Roadster variant would receive the same treatment as its hardtop sibling. Turns out we’ll get to see it in the metal at Frankfurt next week, where Lamborghini will lift the wraps off the new 2018 Aventador S Roadster. Ahead of its world premiere, the Italian automaker has released the first juicy details and images of its new spiced up convertible. As expected, all the cosmetic and mechanical upgrades from the Aventador S Coupe have been carried over to the Roadster, with the extra advantage of an exhilarating open-air driving experience as the only mid-rear engine V12 super sports roadster. It retains the same aggressive front-end as its hardtop sibling distinguished by its elongated front splitter, but the rear has been altered to accommodate the Roadster’s removable hardtop roof panels that weigh less than six kg each. These have been convexly molded to prevent the cabin space from being compromised for occupants, and can be quickly removed using an easy fastening system and stored in the front trunk. Buyers can have the roof panels finished in matt black carbon fiber at no extra cost, or high gloss black, shiny visible carbon fiber, and further Ad Personam possibilities. Those who want to listen to the sweet sound of the Aventador S Roadster’s V12 in all its glory can open the electric rear window at the press of a button. With the roof down, the window minimizes cabin noise and airflow. Tipping the scales at 1,625 kg, the Aventador S Roadster is 50 kg heavier than the Coupe. This hasn’t had a noticeable effect on the performance, however. 0-62 mph takes three seconds compared to the 2.9 seconds the Aventador S Coupe needs to sprint off the line. As with the Coupe, power is sent to all four wheels by a 6.5-liter naturally aspirated V12 engine developing 730 horsepower and 509 lb-ft of torque. New technology developments introduced in the Aventador S Coupe have also been applied to the Roadster, including four-wheel drive, new active suspension, and the new EGO driving mode. The new four-wheel steering system offers improved agility at low speed and more stability at high speed. As with the Coupe, an active rear wing optimizes the car’s aerodynamic balance, while the aerodynamic design improves front downforce by more than 130 percent over the previous Aventador according to Lamborghini. In its optimum position, the wing helps the Roadster achieve over 50 percent overall efficiency at high downforce and more than 400 percent in low drag. 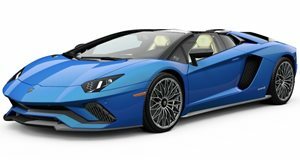 Lamborghini will launch the Aventador S Roadster in the Ad Personam Color Blu Aegir shown in the official photos, inspired by “the peaceful turquoise ocean hiding an indomitable force beneath.” Numerous other personalization options will be available for the exterior and interior. The cabin can be customized with a wealth of Alcantara and leather options: the roof panels, for example, can be covered in black Alcantara if you don’t fancy the standard matt black carbon finish. Carbon fiber is used extensively throughout the car. The side mirrors and windshield are finished in high gloss carbon fiber, while visible carbon fiber adorns the front and rear bumper, side skirts, air intakes and outlets. Prices for the Lamborghini Avendator S Roadster start at $460,247 in the US, with customer deliveries scheduled to start in February next year.